I met the Miracle Midge as the result of an exceptional fishing trip. and, not incidentally, to fish our hearts out on the grand South Platte River. So we saved our pennies, then splurged. We lived for several weeks in a cabin at Crystal Lake Resort in Pine, Colorado, with the North Fork of the South Platte slowing through the productive pool outside our door; a small, angular, man-made lake nearby (used for commercial ice-making in the 1920s) whose edges were patrolled by large cutthroat-rainbow hybrids; and a clear pond at the head of the lake where rainbows to four pounds lazed all day in plain sight beneath a slick surface. During those fall weeks, we saw a lot of Baetis mayflies popping from both the North Fork and the main South Platte, usually on cloudy days. But we saw midges almost every day, and they made the tiny mayflies look...well, substantial. The midges matched hooks down to size-26 and, since most of the Colorado trout we encountered were truly discriminating, we fished size-22 to -26 flies knowing that a good fish would have the advantage. So we regularly broke fine tippets and lost fish. But we sometimes landed and returned better trout than seemed possible on such diminutive hooks. One of the hot local flies for midge hatches, we were told at the area fly-shops, was the Miracle Midge. Not much to it, just a hook, rib, thread-body, and a little dubbing for a thorax. I dangled it in front of the swaying trout of the Crystal Lake Resort pond and hooked some—and those trout typically ignored a lot of flies. But mostly I used this little fly on the South Platte. Sometimes I let it drift freely to trout seeming to float as in air just a foot below the surface of the water—a common sight on the South Platte. With no strike indicator, I had to watch closely for a stall or twitch of the leader or the white wink of a trout's open mouth. It worked. I also fished it below a tiny "corkie," a brightly colored cork ball mounted on the leader. About a foot and a half above the fly I'd attach a little weight. The corkie would dive or just act funny and the cause was sometimes a handful of fish for a size-22 hook. I even fished it on a few inches of leader below a small dry fly to showing fish, and that worked too, the dry fly doing the corkie's work. The Mercury Midge seems cut from the same cloth as the Miracle Midge—rib, slim thread-body, dark thorax—and what works for the one fly should work with the other. The one real difference is that the Mercury Midge includes a glass bead to help it sink quickly. It was another popular fly in Colorado, but I never got to testing it. Too many sharp fly fishers swore by the effectiveness of the Mercury Midge, though, for me to doubt it. Both of these midge-pupa (and possibly midge-larva)imitations share a trait common to many tiny fly patterns: they are of elemental design and easy to tie. require only basic tying techniques. use materials extremely sparingly—even a wisp of dubbing on a size-24 hook can be plenty. Finding tiny hooks of the heavy wire that helps nymphs sink is sometimes a challenge. There are few heavy wire hooks of size-20, and even fewer under 20. Most tiers use standard or even light-wire dry-fly hooks for tiny nymphs when they must, and get along just fine. Some time in my personal library and on-line gave me no clue as to who created the Miracle Midge. The Mercury Midge (also called the Mercury Black Beauty) is the creation of Colorado fly-fishing author Pat Dorsey. Both patterns come in a range of colors, but my research suggests that former is typically white and the latter typically black...though lots of details about these patterns seem unsettled. Doesn't seem to matter to the trout, though. 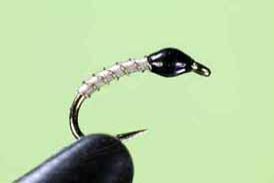 the Mercury Midge, and gives you a detailed pattern for both.